Despite trailing for the majority of the game, the Ham Slams responded in the final two innings and rode Alec’s strong pitching performance to a 5-2 win over the Fish Sticks. 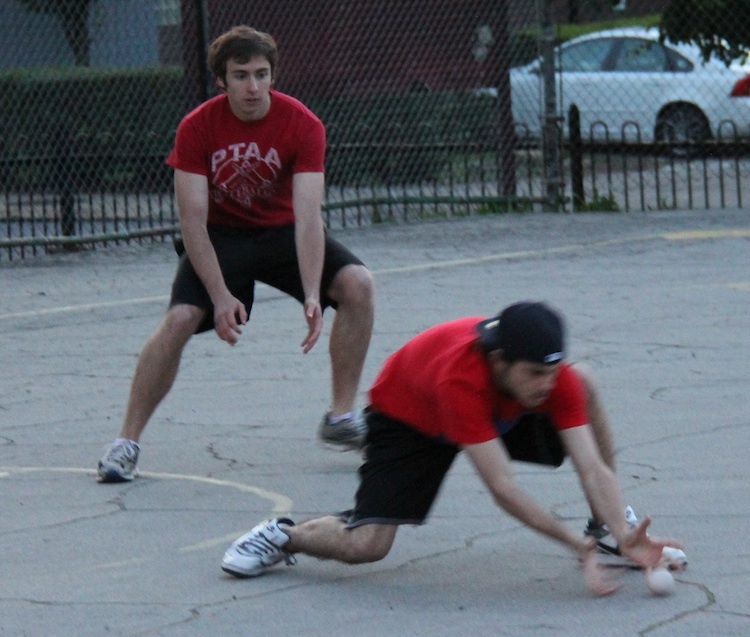 The last these teams met, the Sticks blew a late lead to the Ham Slams in a disappointing loss. 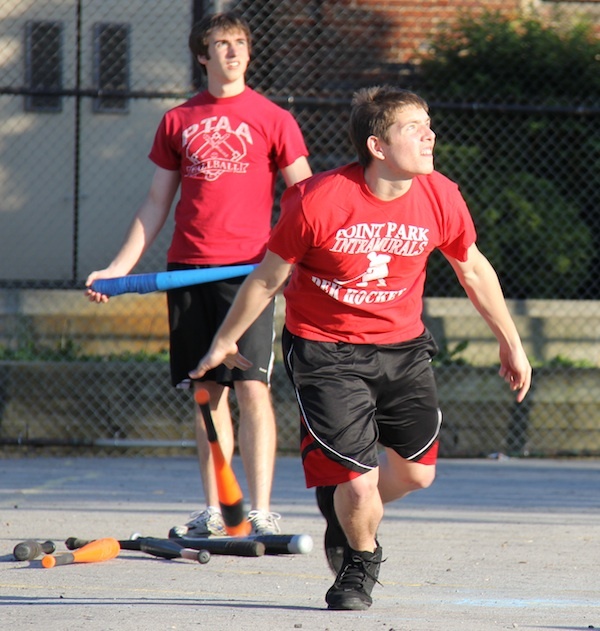 Joey would face the Slams for the Sticks for the second consecutive game, and he looked sharp early. Anthony singled to lead off the game, but when TJ grounded out to Vassallo in left, Vassallo caught Anthony trying to advance from first to third. The double play ended the inning. The Ham Slams started Alec on the mound for the second time in his career. Blose led off by doubling off the wall, and moved to third when Joey followed with a single. With runners on the corners and no outs, Vassallo singled, driving in Blose and moving Joey to second. The Sticks were up 1-0 with runners on first and second. It looked as if the Sticks would open up a big lead early for the second consecutive game, but Alec settled down and managed through the jam. He got Ivan to fly out to Evan in left for the first out of the inning, and stranded both runners when inger grounded out to left to end the inning. Down one, the Slams went quickly in the top of the second. Evan and Alec were both retired by Vassallo, by fly out and ground out, respectively. Alec retired Blose and Joey in the bottom of the second, and had retired four straight batters. Joey continued to roll in the top of the third. 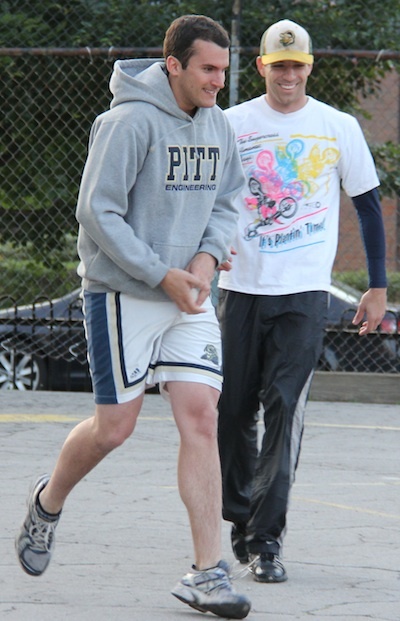 He retired Steve and Anthony in order, and the score remained 1-0. The Sticks added a run in the bottom of the third, starting when Vassallo tripled to lead off the inning. Ivan flew out to deep left, but Vassallo tagged from third and scored, and the Sticks lead was 2-0. With one out and nobody on base, Dinger grounded out to left for the second out of the inning. TJ and Evan went down in order in the top of the fourth, and Joey had retired 7 consecutive batters without a base runner. Alec got back into the groove in the bottom of the fourth inning, as he retired Blose and Joey in order for a scoreless frame. Down two runs and having not reached base since the opening batter, the Ham Slams finally cracked Joey in the top of the fifth. Alec flew out to Blose in center for the first out of the inning, but the Slams rallied. Steve singled to lead off the inning, and when the next batter, Anthony, crushed a two-run blast to left field, the game was tied at 2-2. TJ hit a one-out single, and Evan put the Ham Slams in front for the first time in the game when he hit a 2-run shot, pushing the score to 4-2. Joey fanned Alec for the second out of the inning, but after cruising through four innings, Joey had relinquished the lead in the fifth. It looked like the Sticks would rally in the bottom of the fifth. Vassallo led off the inning with a single, and after Ivan flew out for the first out of the inning, Dinger singled, pushing Vassallo to third and putting runners on the corners with one out. Blose came to the plate as the lead run, but couldn’t cut into the Slams lead, as Alec got him to fly out to right field to end the inning, stranding two runners on base. Joey continued to struggle in late-inning work in the top of the sixth. Steve led off the inning by taking Joey deep, pushing the Ham Slams lead to 5-2. Joey pulled himself from the game, bringing in Blose for relief. He retired Anthony and TJ in order to end the inning, but the Sticks trailed by 3 runs heading into their final at-bat. 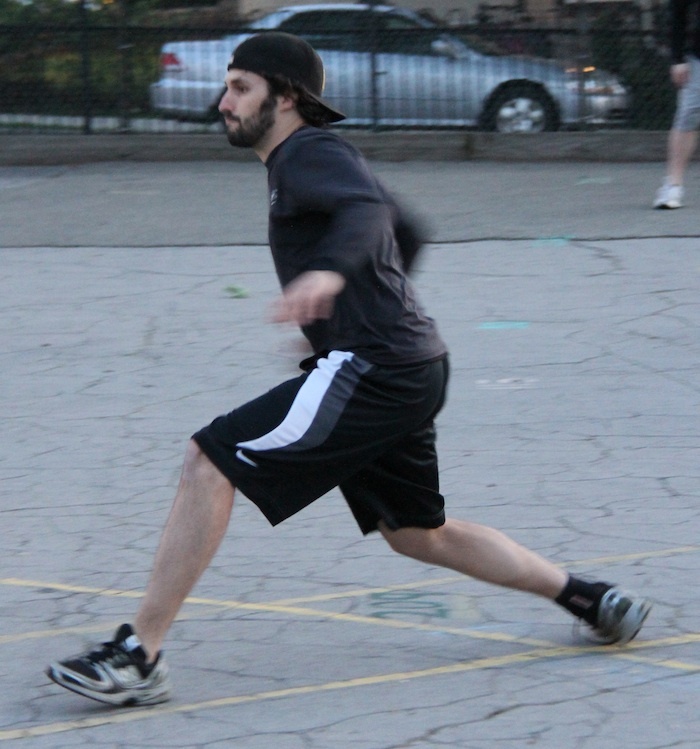 Alec stayed in the game despite a save opportunity being present for the Slams. He got Joey to ground out to left for the first out of the inning, then struck out Vassallo to end the game, earning the complete game win. The win moved the Ham Slams to 2-0 against the Fish Sticks and 3-3 on the season. The loss dropped the Sticks to 3-3 on the year. In a back-and-forth game where both pitchers struggled to keep the ball in the park, four of the five Fish Sticks homered in an 8-7 win over Bobby Brown. The Sticks sent Dinger to the mound, who was 1-1 and coming off the season’s best pitching performance against the Caucasians. He got off to a good start in the first, retiring Gaurav and Helal in order for a scoreless inning. Gaurav came into the game a perfect 2-0, but struggled early and his worst inning of the season in the first. Blose led off the game by belting a pitch off the right-centerfield fence. After a series of fielding errors, he rounded the bases for a leadoff inside-the-park home run, the first in league history. Gaurav retired Dinger, the next batter, but Joey followed with a one-out double. Ivan came to the plate, fresh from missing week 2, and hit a two-run blast, his first of the season. The next batter, Vassallo, crushed a homer to left field, and the Fish Sticks were up 4-0 early. Gaurav held the damage at 4 runs, as he got Blose to groundout to right for the second out of the inning. Bobby Brown got their bats out in the top of the second and chipped into their 4 run deficit. Holly led off the inning by grounding out to center, but Brad followed with a one-out double. The next batter, Gaurav, singled, as Brad raced home from second to cut the score to 4-1. With a runner on first, Helal continued the one-out rally, hitting a two-run shot to deep right field, and the score was 4-3. Despite giving up 3 runs, Dinger preserved the lead, getting Holly to ground out to left for the second out of the inning. Dinger couldn’t help himself at the plate in the bottom of the second, as he grounded out to left to start the inning. With one out, Joey hit a deep home run to left-center, his first of the season, pushing the score to 5-3. Gaurav retired the next batter, Ivan, to end the inning. Bobby Brown continued to hit Dinger hard in the top of the third. Brad led off the inning with a laser home run, making the score 5-4. Dinger fanned Gaurav for the first out of the inning, but Helal followed with his second homer of the game, which tied the game at 5-5. The next batter, Holly, made back-to-back jacks by hitting a deep fly over the right field fence, and Downtown had their first lead of the game at 6-5. Brad couldn’t extend the inning, flying out to the mound for the second out of the inning. The Fish Sticks quickly responded in the bottom of the third. After Vassallo grounded out to center for the first out of the inning, Blose hit a one-out double, putting the tying run in scoring position. Dinger followed with a double, driving in Blose and tying the game at 6-6. With Dinger on second, Joey stepped to the plate and hit a 2-run homer, his second in as many at-bats, and the Sticks had regained the lead at 8-6. Gaurav remained in the game, and retired Ivan to end the third. Gaurav looked to provide his own run support in the top of the fourth, and led off the inning with a single. He moved to second when Kyle grounded out for the first out of the inning, and the tying run was at the plate with a runner on. But Dinger escaped, stranding Gaurav at second when he got Holly to fly out to Ivan in right field for the second out. Vassallo led off the bottom of the fourth with a single, but the Fish Sticks wouldn’t add to their lead. Gaurav retired Blose and Dinger in order for a scoreless fourth. Down two runs, Brad led off the top of the fifth with a single. Mark, inserted into the lineup, grounded out to left, pushing Brad into scoring position at second. The next batter, Gaurav, singled, and for the second time in the game Brad raced home from second. The hit cut the Fish Sticks lead to 8-7. The tying run was on first, but Dinger got Helal to ground out to left for the second out of the inning. The Sticks lead had been cut to one and they looked to add insurance runs in the bottom of the fifth. Gaurav retired Joey for the first out of the inning, but Ivan followed with a one-out single. The Sticks failed to add to their lead, however, as Vassallo grounded out to left, stranding the runner on first and ending the inning. With a one-run lead, the Sticks turned to their closer, Blose, to seal the deal. He had no trouble closing out the game, as he got both Holly and Brad to ground out to Joey in center for a perfect sixth, earning the first save for any pitcher in the 2012 season. The win moved the Fish Sticks to 3-2 on the season, as Bobby Brown fell to 2-3. – Joey led the Fish Sticks offensively, going 3 for 4 with a double, 2 homers, 3 RBI, and 3 runs scored. He also recorded 2 putouts in the field. – Helal led Bobby Brown, going 2 for 5 with 2 homers and 3 RBI. Brad also played well, going 3 for 5 with a single, a double, a homer, 3 runs scored and an RBI. – Dinger picked up the win for the Sticks, giving up 7 runs on 9 hits in 5 innings, striking out 1. – Blose is the only pitcher in league history to record a save. He now has 4 for his career. 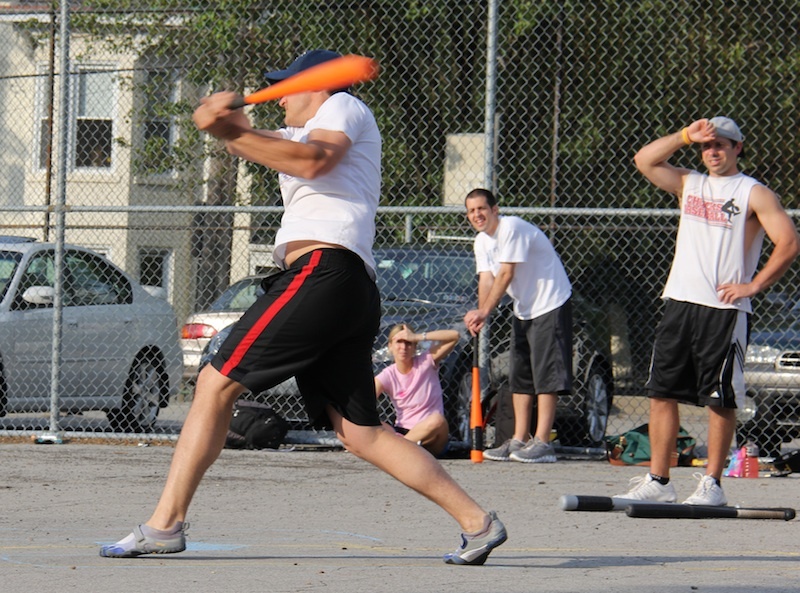 Three of the four Caucasians homered and Morrison finished with 5 extra-base hits, as the Caucasians pulled away from the Ham Slams with an 8-run third inning to win 12-5. 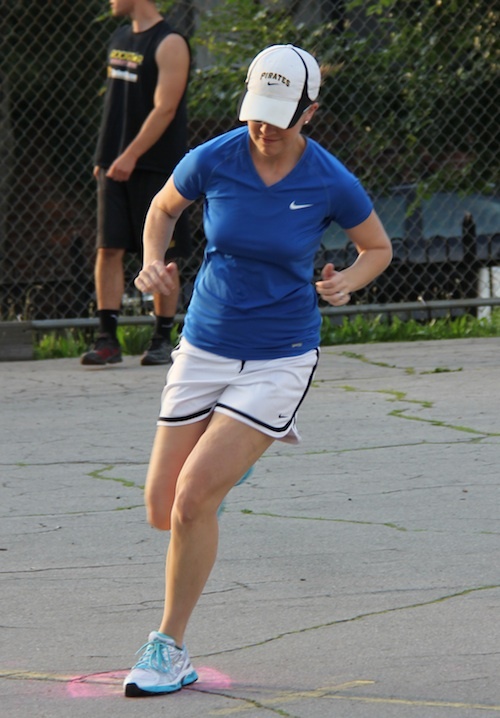 Guthrie, who started for the Caucasians, came into the game 1-1 and got into trouble early against the Ham Slams. The first batter, Anthony, hit a solo shot to left-center that put the Slams up 1-0. Guthrie settled down after giving up the leadoff homer, retiring TJ and Evan to end the top of the first. 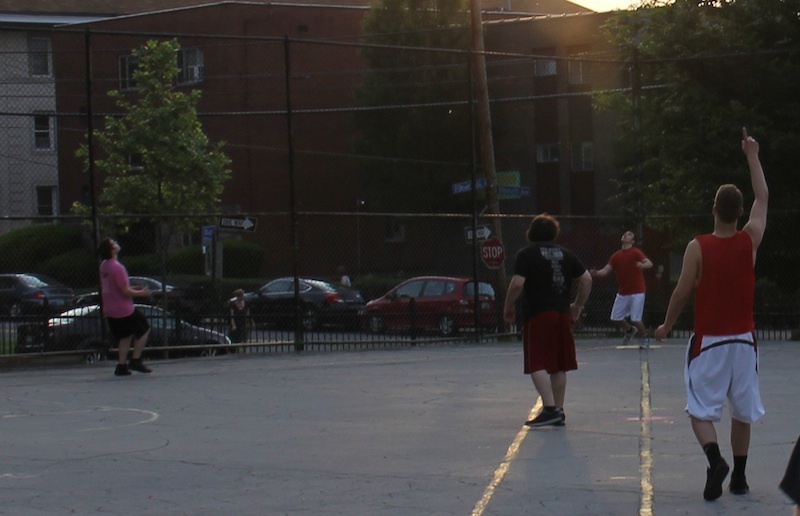 Evan started for the Ham Slams, and he came into the game with an 0-1 record. A half-inning after the Ham Slams led off the game with a homerun, the Caucasians returned the favor, when Morrison blasted a homer to deep center field, tying the game at 1-1. 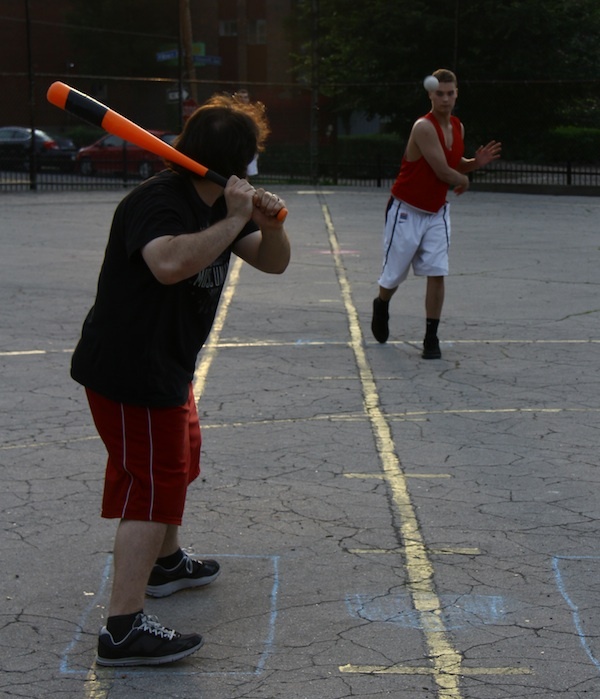 Evan retired the next batter, Frosty, but Ron followed with a one-out solo home run, putting the Caucasians up 2-1. Guthrie was retired for the second out of the inning, and the Slams went into the second trailing by a run. Alec led off the top of the second by grounding out to Morrison in left. Anthony followed with a one-out triple, putting the tying run on third base. But Guthrie escaped the jam, as TJ flew out to Frosty in right field for the second out of the inning. Morrison flew out to the mound for the first out of the bottom of the second. Frosty singled, but was stranded at first when Ron also flew out to Evan, ending the second. Down a run, the Slams figured out Guthrie in the top of the third. Evan led off the inning with a solo homer, tying the game at 2-2. Guthrie got Alec to ground out to left for the first out of the inning, but the Slams rallied with one out. Free agent addition Steve, playing DH, singled in his first career at-bat. He moved to third when the next batter, Anthony, doubled. With two runners in scoring position and the game tied, TJ came to the plate and hit a three-run blast to left, putting the Ham Slams up 5-2. 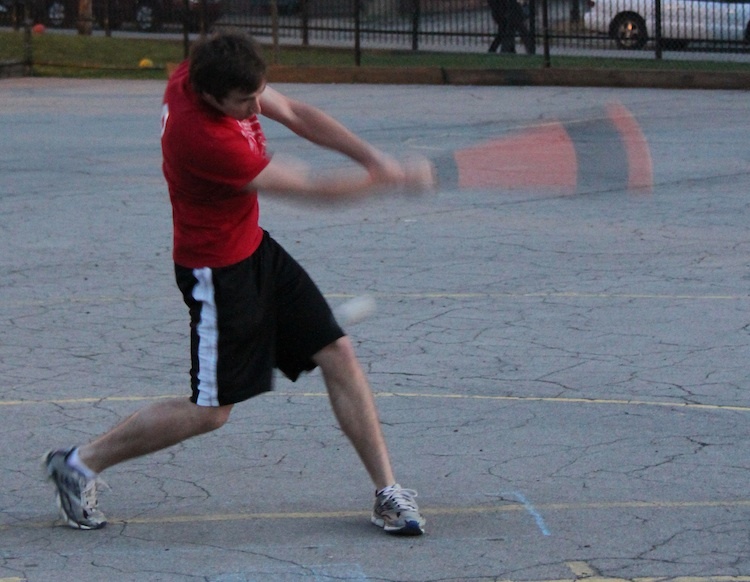 Evan was retired for the second out of the inning, but the Slams had retaken the lead. The lead didn’t last long and it wouldn’t return after the Caucasians erupted in the bottom of the third inning. They unleashed an offensive fury that hadn’t been seen since early in the 2011 season. Guthrie led off the inning with a single, and Morrison followed with a two-run home run, cutting the score to 5-4. The Ham Slams struggled heavily in the field, as Frosty singled, then moved to third when Ron doubled. With no outs and two runners on, Guthrie clubbed a three-run homer, putting the Caucasians back in front 7-5. The first 5 Caucasians to hit in the third had reached base safely, and the Ham Slams turned to the bullpen, sending TJ in to relieve Evan. The Caucasians continued to pour it on, however, as Morrison doubled, and immediately scored when Frosty doubled, driving him in. The next batter, Ron, hit a two-run homer, the Caucasians third of the inning, pushing the score to 10-5. 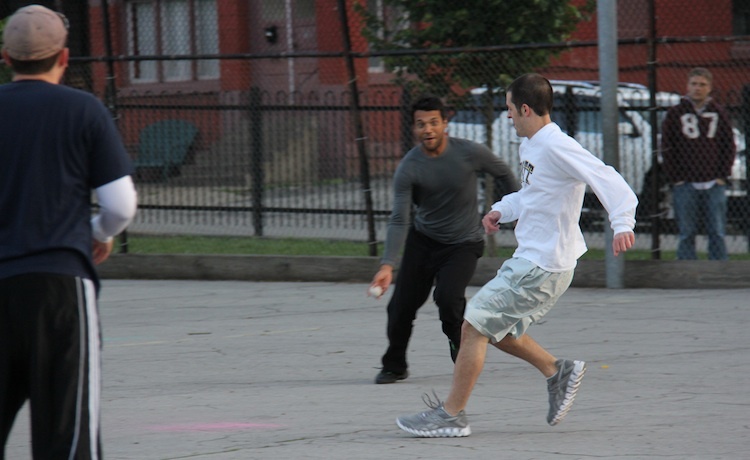 The Caucasians had scored 8 consecutive runs, all with no outs, and each Caucasians had 2 hits in the inning. TJ finally recorded an out when Guthrie flew out to the mound, ending a streak of 8 consecutive hits, which tied the league record. The next batter, Morrison, doubled for his third hit of the inning, but was caught out trying to extend a double into a triple. The inning had come to an end, and the Slams had went from being up three runs to trailing by five. Guthrie rolled in the top of the fourth, as Alec and Steve were sent down consecutively by ground out. The Caucasians added to their lead in the bottom of the fourth. Frosty doubled off TJ to lead off the inning, and moved to third when Ron singled, putting runners on the corners. Guthrie flew out to shallow center for the first out of the inning, and the Slams held Frosty from tagging. But the next batter, Morrison, roped a double off the fence, his third double of the game, driving in both Frosty and Ron and making the score 12-5. TJ retired the next batter, Frosty, ending the inning. It looked as if the Slams would rally in the top of the fifth. Anthony doubled to start the inning, and moved to third when TJ singled. The Slams had runners on the corners with no outs. But Guthrie buckled down and escaped another jam without harm. He got Evan to fly out to Ron in left for the first out of the inning and Alec flew out to Frosty in center for the second out of the inning, stranding both runners. TJ held the deficit at 7 runs in the bottom of the fifth. He started the inning by getting Ron to ground out to Evan in left field. Guthrie followed with a single, but Morrison flew out to deep left for the second out of the inning. Guthrie remained in the game to close things out for the Caucasians, and the Slams couldn’t rally in the top of the sixth. Steve flew out to the mound for the first out of the inning, and Anthony, a single away from hitting the cycle, grounded out to Ron for the second out of the inning, ending the game. 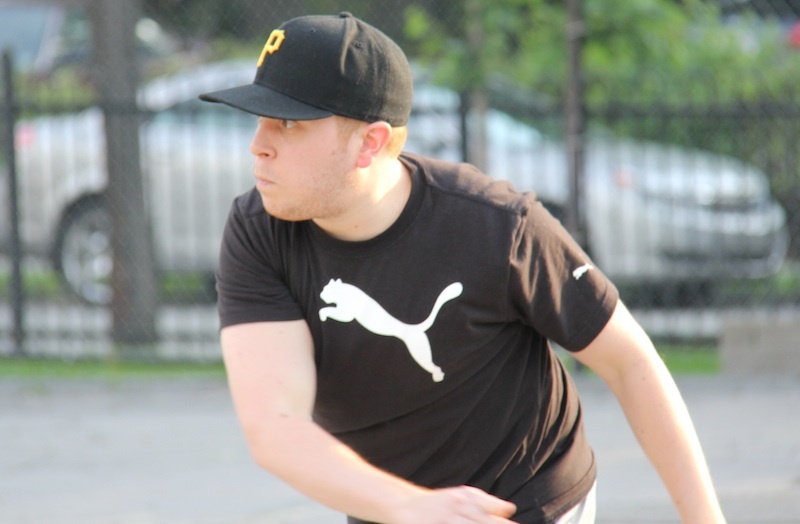 The Caucasians moved to 3-2 on the season with the win, and the Ham Slams fell to 2-3. – Morrison led the Caucasians offensively, going 5 for 7 with 3 doubles, 2 homers, 5 RBI, and 3 runs scored. He also recorded 5 putouts in the field. 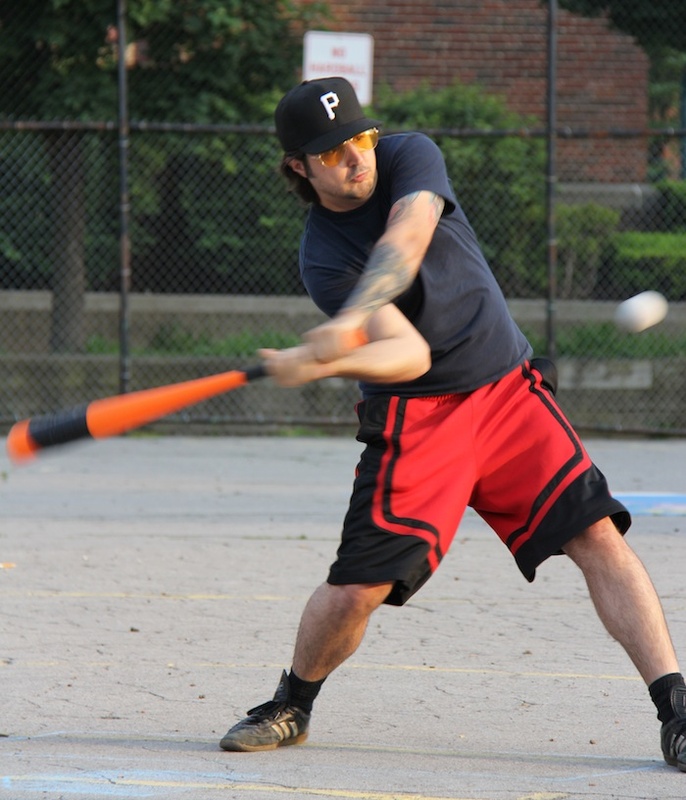 – Anthony set the pace for the Ham Slams on offense, going 4 for 5 with 2 doubles, a triple, and a home run. He also had 2 runs scored and an RBI. He needed a single for the cycle in his fourth at-bat, but stretched a hit into a double. He finished the game a single short of the cycle. – Guthrie picked up the win, pitching 6 innings for the complete game, giving up 5 runs on 8 hits. – Morrison’s 3 doubles ties Blose’s record of 3, which he set just last week. – Anthony became only the 9th player in league history to hit a leadoff home run. Morrison became the 10th player to do it in the next inning of that same game. Morrison hit leadoff homeruns in two consecutive games. 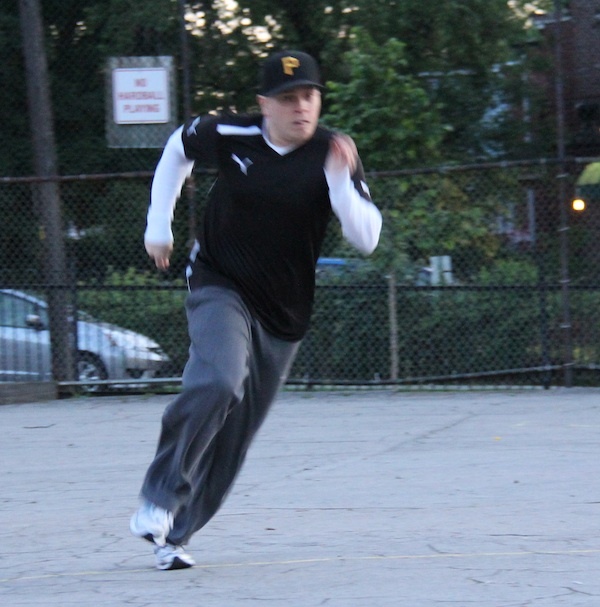 In the next game, Blose’s inside-the-park leadoff homerun was the 11th leadoff homerun in league history. 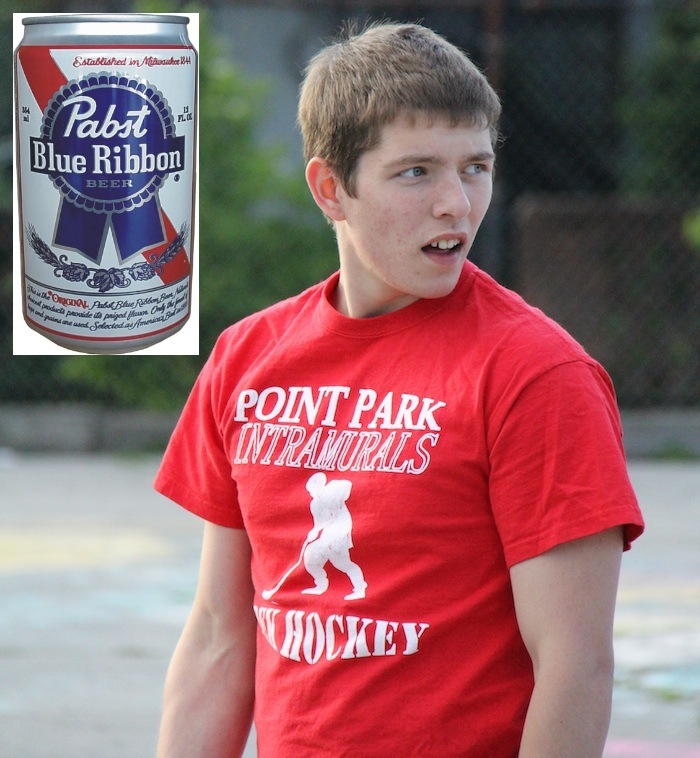 After giving up the game-winning homer in a painful loss to Downtown Bobby Brown, Evan bounced back to lead his team over the Fish Sticks, and was recently voted the Pabst Blue Ribbon Wiffler of the Week for the second week of the 2012 EWL season. In the Ham Slams first game, Evan helped his squad jump out to an early lead, as he went 4 for 5 with a single, 2 doubles, a homer, 2 runs scored and an RBI. He was also solid on the mound, as he only gave up 1 run on 4 hits through the first 5 innings. Unfortunately, he gave up four consecutive hits, including the game-winning walk-off homer in the sixth inning he pitched, picking up the complete game loss. He also registered 2 putouts and struck out a batter in the game. In the night cap, Evan helped the Slams storm back in the late innings to beat the Fish Sticks. He led them offensively, going 3 for 5 with a single, 2 doubles, a run scored, and an RBI. He also tallied 7 putouts in the field. Evan is the second consecutive rookie to earn the PBR Wiffler of the Week honor. He dominated the fan voting for Wiffler of the Week. Morrison, who had a monster week 2, came in second. 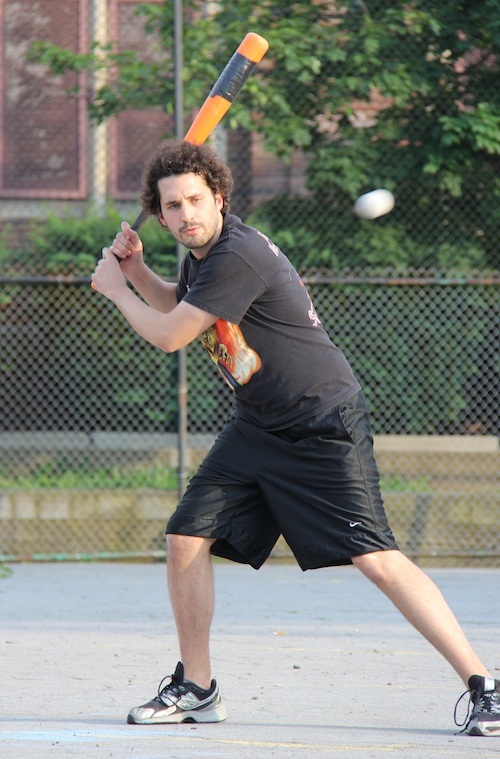 For the week, he went 9 for 11 at the plate, leading the Caucasians to a blowout win over Bobby Brown. 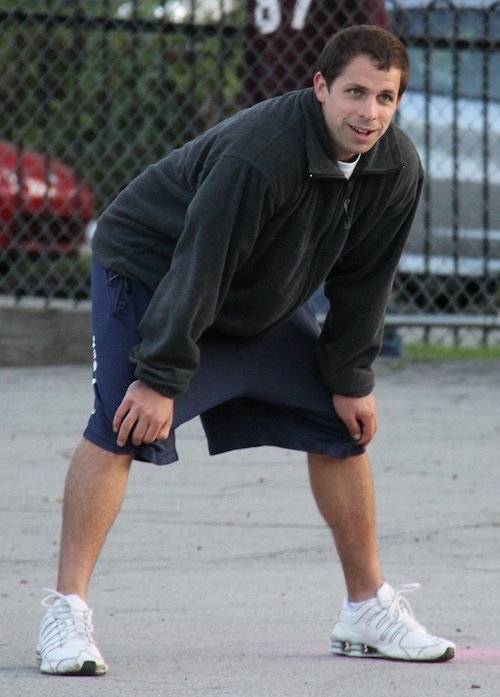 He also was the only player to show up offensively for the Caucasians against the Fish Sticks. He recorded 6 singles, a double, and 2 home runs in addition to 3 runs scored and 4 RBI. Defensively, he made 10 putouts over the two games. Two weeks of EWL action are in the books, and all four teams are tied at 1-1 in the standings. No team has pulled away yet, and no players have separated themselves from the pack. The league is as competitive as it has ever been, and the season is off to a promising start. Down four runs in the bottom of the fourth, the Ham Slams, led by free agent acquisition Matt, scored 6 runs in the fourth and fifth inning in a comeback win over the Fish Sticks. 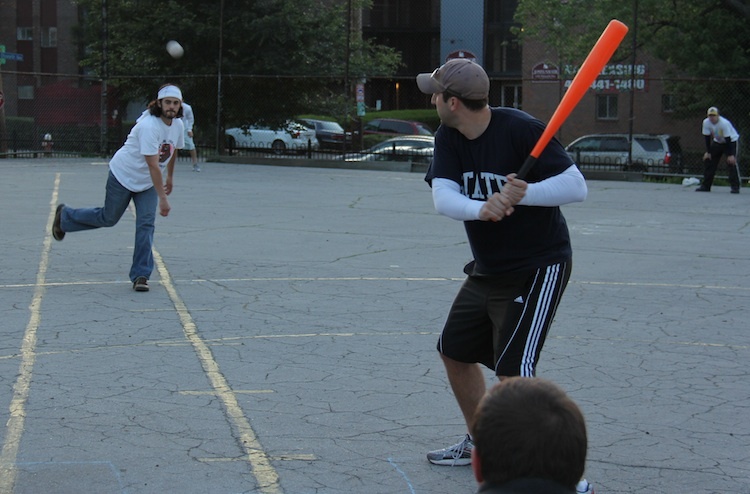 This was the first matchup between the Fish Sticks and the Ham Slams, and the last two teams to meet for the first time in the 2012 season. The Ham Slams sent Evan to the bump for his second consecutive start, knowing he had only two innings of eligibility remaining. 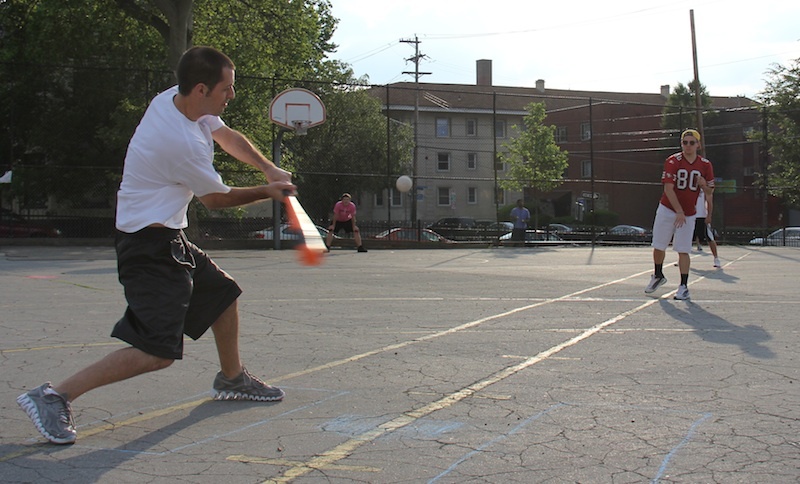 The sun was setting on the wiffle diamond and darkness would become an issue before the game was finished. Dinger led off the top of the first for the Fish Sticks with a single, and he moved to second on a Vassallo groundout. With one out, Joey roped a double off the tree, scoring Dinger and putting the Sticks up 1-0 early. The next Batter, Blose, followed with another double, scoring Joey from second and moving the score to 2-0. Evan got Dinger to fly out to the mound for the second out, stranding Blose at second and ending the inning. Joey started for the Fish Sticks and got off to a good start. He retired Adam and Matt in order in the top of the first for a scoreless inning. Evan settled in on the mound in the top of the second, retiring Vassallo and Joey consecutively to keep the score at 2-0. Joey continued to roll in the bottom of the second, as Evan and Harrison were retired in order. With Evan’s inning limit reached, the Slams turned to Matt to pitch in the top of the third. Blose led off the inning by grounding out to center. Dinger followed with a one-out single, his second of the game, but was stranded at first when Evan got Vassallo to groundout for the second out of the inning. Down two, the Slams showed life in the bottom of the third. Adam led off the inning with a double, but was caught off the base after he rounded second heading toward third, and was retired for the first out of the inning. It looked as if the Slams would rally with one out, as Matt singled, then moved from first to third when Evan followed with a one-out double. But Joey got out of the jam safely, as he got Harrison to fly out to Dinger in right field for the second out of the inning, stranding two runners in scoring position. The Sticks got back to work in the top of the fourth. After Joey grounded out to left for the first out of the inning, Blose hit his second double of the game. Dinger followed with another double, driving in Blose and pushing the Sticks lead to 3 runs. The next batter, Vassallo, became the third consecutive batter to double, driving in Dinger from second and moving the score to 4-0. Evan got Joey, the next batter, to groundout for the second time in the inning, ending the rally. 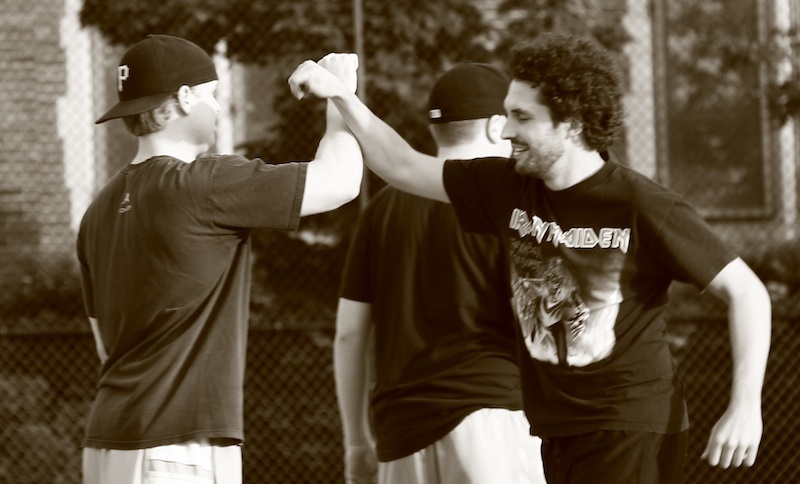 The Slams came close to scoring in the bottom of the third, and finally would crack Joey in the bottom of the fourth. Adam led off the inning with a single, and moved to second when Matt followed with another single. With no outs, Evan hit a double to right-center, scoring Adam and getting the Slams on the board. With runners on second and third, Harrison followed with a single, his first hit of the game, driving in Matt and Evan and cutting the deficit to a single run. Joey finally got Adam to ground out to the mound for the first out of the inning, but there was still a runner in scoring position on second. The next batter, Matt, hit a triple, driving in Harrison and tying the game at 4-4. Joey got Evan to groundout to right field, stranding Matt at third and maintaining the tie, but the damage had been done. The Slams decided to make another pitching change, bringing Harrison into the game to replace Matt. The tie the Slams had fought for didn’t last long, as Blose led off the top of the fifth with a double. The next batter, Dinger, grounded out to left, moving Blose to third. With one out, Vassallo hit a single, driving in Blose and putting the Sticks back on top 5-4. Joey followed with a single, putting runners on first and second with one out. But the Sticks couldn’t add to the lead, as Blose grounded out to left to end the inning. Trailing again, the Slams came to the plate down one with four outs to go. Harrison quickly lowered that to 3 outs, as he grounded out for the first out of the bottom of the fifth. But then the Ham Slams rallied. Adam singled with one out, and the next batter, Matt, belted a two-run homer to center field, putting the Ham Slams up 6-5. Evan followed the blast with a single, and moved to third when Harrison singled. With runners on the corners and one out, the Slams couldn’t extend their lead, as Adam flew out to Joey on the mound to end the inning. 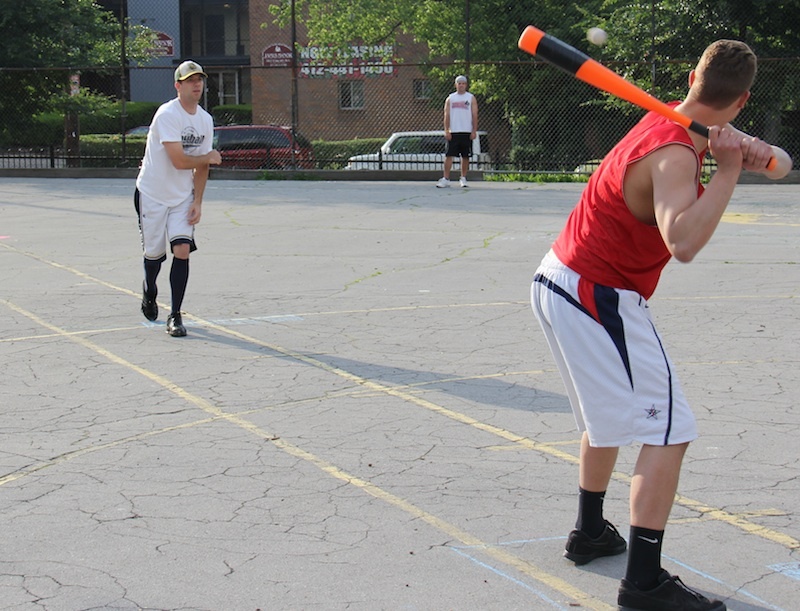 Down to their final two outs, the Fish Sticks were facing yet another blown lead. Harrison remained on the mound, and the Sticks couldn’t get their bats going. Dinger flew out to left for the first out of the inning, and the next batter, Vassallo, grounded out to Evan in left for the second out, ending the game. The Slams had scored six runs in their final two at-bats to come from behind and stun the Fish Sticks 6-5. 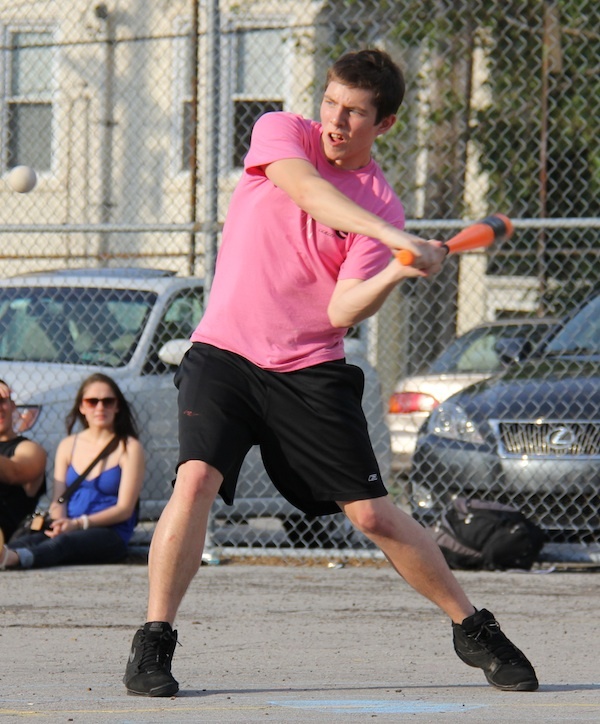 – After going hitless in his rookie debut, Matt went 4 for 5 with two singles, a triple, a homer, 3 RBI and 2 runs scored. He and Evan, who went 3 for 5 with a single, 2 doubles, a run scored and an RBI, led the Slams on offense. The Caucasians had a banner day at the plate, including Frosty hitting for the cycle, as they broke multiple single-game offensive records en route to destroying Bobby Brown 12-3. 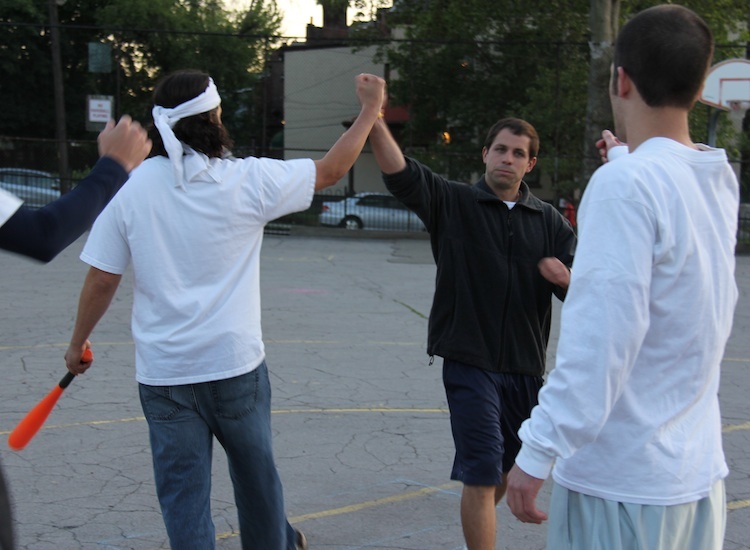 After winning their season opener against the Fish Sticks with a dramatic comeback, the Caucasians had dropped two straight coming into their fourth game against Bobby Brown. 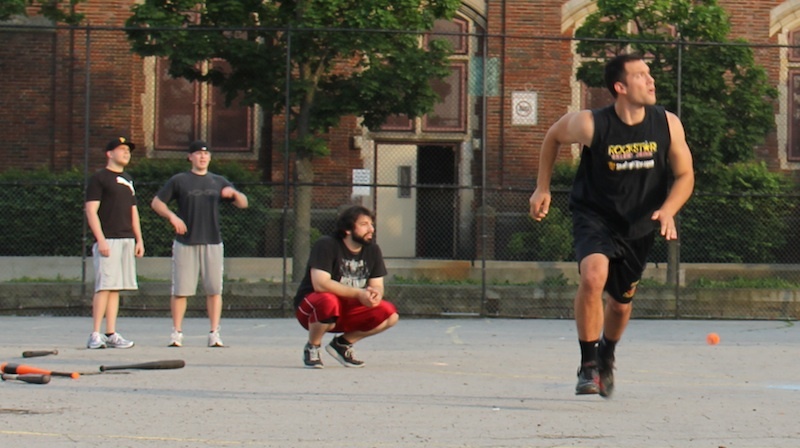 Downtown, on the other hand, won a heartstopping game against the Ham Slams directly prior to playing the Caucasians and looked to have some momentum heading into their second game of week 2. 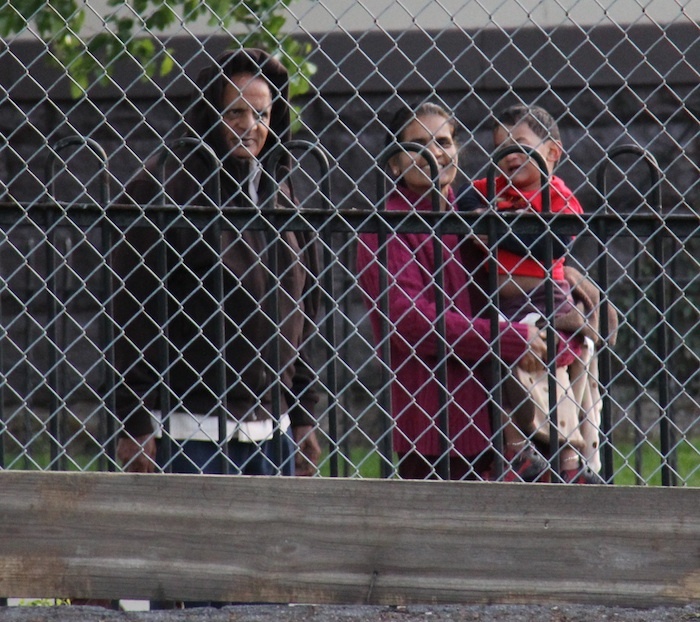 But the Caucasians came storming out of the gate and never looked back. Downtown sent Mark to the mound for his first career start, and the southpaw never looked comfortable from the get-go. The Caucasians pounded him early and a barrage of fielding errors didn’t help his cause. Frosty led off the first inning with a single, his first hit of the 2012 season, and Morrison followed with a single. With runners on first and second, Les doubled off Mark, driving in Frosty to put the Caucasians up 1-0. With no outs and two runners in scoring position, Guthrie singled, scoring Morrison from third, and extending the lead to 2-0 with no outs. Ron flew out to the mound for the first out of the inning, but the Caucasians were far from finished in the first. Frosty got his second hit of the inning when he crushed a three-run blast to deep left field, scoring Les, Guthrie, and himself, and the Caucasians had a five-run lead in the first inning. Morrison followed with a one-out double, and moved to third when Les singled. The Caucasians had runners at the corners, but Mark fanned Guthrie for the second out of the inning, and the rough start had come to an end. Mark looked to help himself out in the bottom of the first, when he led off the inning with a double. But Les, in his first pitching appearance of the season, got Helal and Brad to each fly out, stranding the runner at second, for a scoreless inning. The Caucasians got back to work at the plate in the top of the second. Ron led off with a single, and scored when Frosty followed with an RBI triple. He was now only a double away from hitting the cycle after only two innings. The next batter, Morrison, singled to center, scoring Frosty from third and making the score 7-0. Mark avoided another disastrous inning, as he got Les to fly out to the mound, and then struck out Guthrie for the second time in the game to end the inning. Down seven runs early, Downtown responded in the bottom of the second. The first batter, Holly, grounded out to left, but Gaurav followed with a one-out single. He scored when the next batter, Mark, hit a two-run bomb to right field, and Bobby Brown was on the board. Les had been hit, but he escaped the inning when he got Helal to ground out to Guthrie in center, ending the inning. With the score 7-2 entering the third, the Caucasians quickly made up for the runs they gave up in the bottom of the second. Ron led off with a solo homer, pushing the score to 8-2. Frosty, needing only a double for the cycle, did exactly that, pushing a base hit into a double with no outs. He became only the second person in league history to hit for the cycle. The next batter, Morrison, singled, pushing Frosty to third and putting runners on the corners with no outs. Mark got Les to ground out to Gaurav in left for the first out of the inning, but Frosty scored from third on the play, making the score 9-2. Morrison moved to third on the ground out, but Mark retired the next batter, Guthrie, for the second out of the inning. Downtown showed some spirit in the bottom of the third when Brad led off the inning with a solo shot, cutting the deficit to six runs. But the rally stopped there, as Les quickly got Holly and Gaurav to ground out to Morrison in left to end the third. The Caucasians continued to rain offense down on Bobby Brown in the top of the fourth, starting with Ron, who led off the second consecutive inning with a homer. His second bomb of the game pushed the score to 10-2. Frosty followed with a single, his fifth hit of the game, and scored when Morrison cleared the bases with a two-run home run. The score was 12-2 and the hit parade continued as Les singled with no outs. Mark stamped his name in the record books for some bad reasons in this game, but with no outs in the fourth, he struck out Guthrie for the third time in the game, becoming the first pitcher in league history to record three K’s in one game. The next batter, Ron, singled, pushing Les to third, but Mark stranded the runners at the corners when he retired Frosty for the first time in the game and for the second out of the inning. Downtown went quietly in the bottom of the fourth, as Les got Mark and Helal to groundout successively to end the inning. After four punishing innings, Downtown pulled Mark and turned to the bullpen. Gaurav had two innings of eligibility left, and came to the mound to provide some relief. He retired Morrison, who was a perfect 4 for 4 coming into the at-bat, for the first out of the inning. Les followed with a single, and the next batter, Guthrie, also singled putting runners on first and second with one out. But Gaurav escaped the inning unharmed, as Ron flew out to Helal in center for the second out of the inning. Down ten runs, Downtown couldn’t figure Les out in the fifth. Brad grounded out to left, and then Holly went down swinging for the second out of the inning. The Caucasians were unable to add insurance runs in the top of the sixth. Frosty grounded out to left for the first out of the inning, and after a one-out single by Morrison, Les grounded out to left to end the inning, stranding the runner at first. 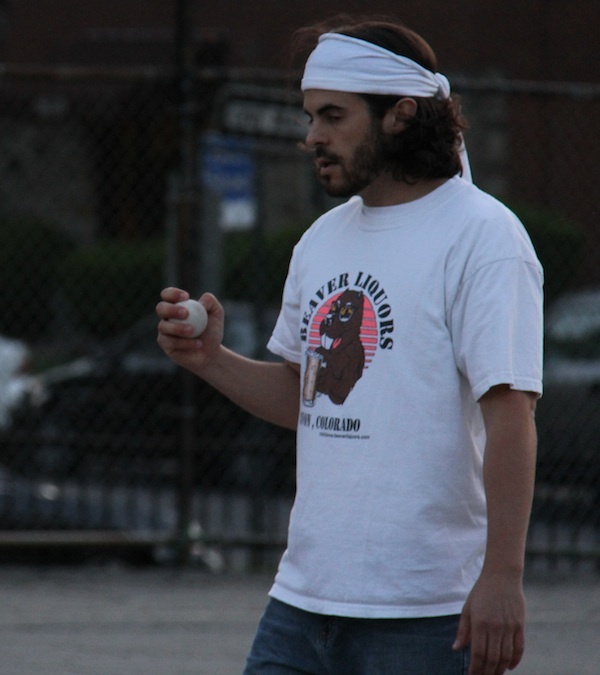 Les stayed in the game to close things out for the Caucasians in the bottom of the sixth. Gaurav grounded out to right for the first out of the inning, and Mark flew out to left for the second out, ending the game and giving the Caucasians a 12-2 win. 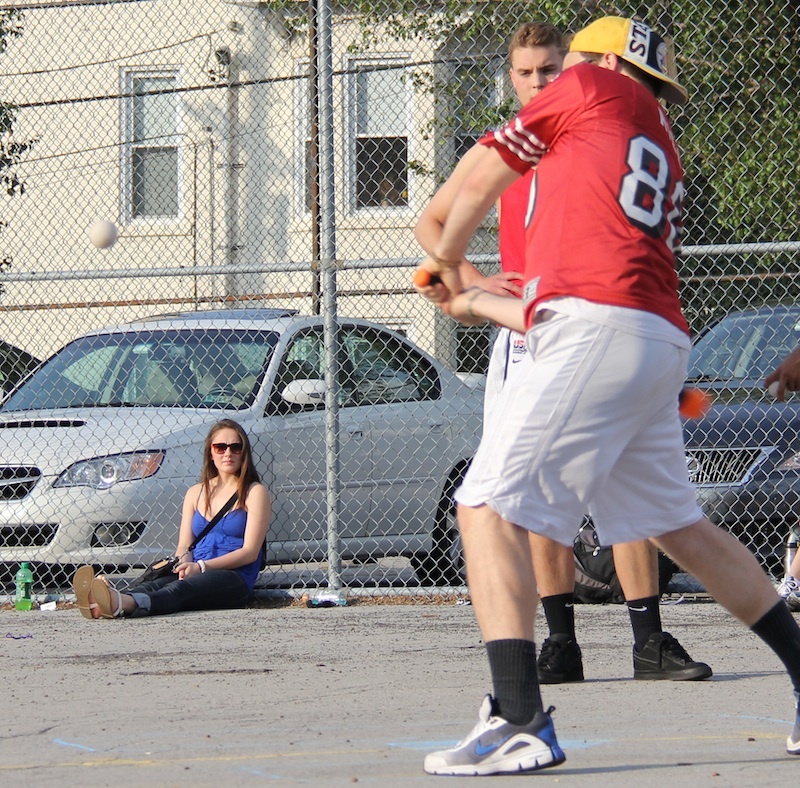 The win moved both the Caucasians and Bobby Brown to 2-2 on the season. – Frosty became only the second player in league history to hit for the cycle in a regular season game, the other was Blose who accomplished the feat on 5/19/11 against Pumice on Slow! 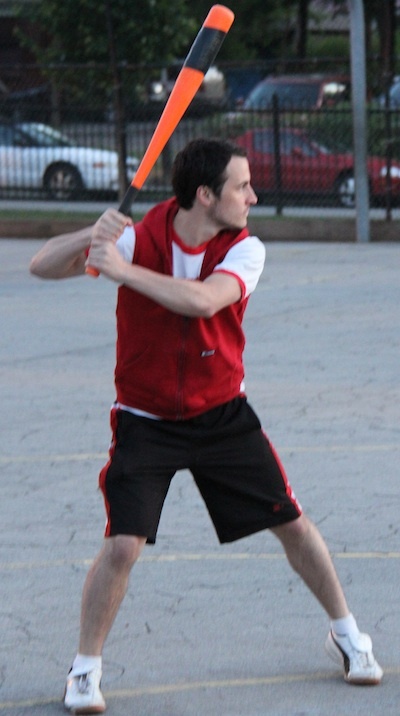 – Frosty went 5 for 7 with 2 singles, a double, a triple, a homer, 5 runs scored, and 4 RBI. He tied a single-game record of 5 runs in one game, previously held by Joey and Blose from 2011. – Morrison went 6 for 7 for the Caucasians with 4 singles, a double, a home run, 2 runs scored and 3 RBI in addition to recording 6 putouts in the field. – Mark led Bobby Brown offensively, going 2 for 4 with a double, a home run, one run scored and 2 RBI. – Mark’s 12 ER broke a single-game record of most runs allowed by one pitcher, previously held by Brad and Holly who each allowed 11 in different starts in 2011. – Mark’s 18 hits allowed broke a single-game record of most hits allowed by one pitcher, previously held by Holly who allowed 16 hits in one appereance in 2011. – The Caucasians 21 hits broke a single-game team record of most hits, previously held by the Fish Sticks who twice recorded 16 hits in 2011. – The Caucasians 13 singles broke a single-game team record of most singles in a game, previously held by the Fish Sticks who recorded 10 singles in a 2011 game. – The Caucasians 3 strikeouts at the plate tied a single-game team record set by the Fish Sticks who also fanned 3 times in a game in 2011. – Downtown Bobby Brown’s 21 hits allowed broke a single-game team record for most hits allowed, previously held by Pumice on Slow! and 4 out of 5 Dentists who each allowed 16 hits in a game in 2011.